Recently I found out how certain additives in food can affect children's (and adult) behaviour/mood, and shockingly these same additives can be found in our toiletries. I decided to look further into this, as I didn't want to waste all the effort I was making to ensure Chunk wasn't getting these additives in his food by giving him these same chemicals when bathing him! I was HORRIFIED by how many shampoos, shower gels and conditioners have either (or both) sodium benzoate and SLS in their ingredients. And the worst thing? The CHILDREN'S products have them in too! I started by looking through all our toiletries and surprise surprise I had to bin his L'Oreal Kids shampoo and conditioner, and some Johnson's bath bits. 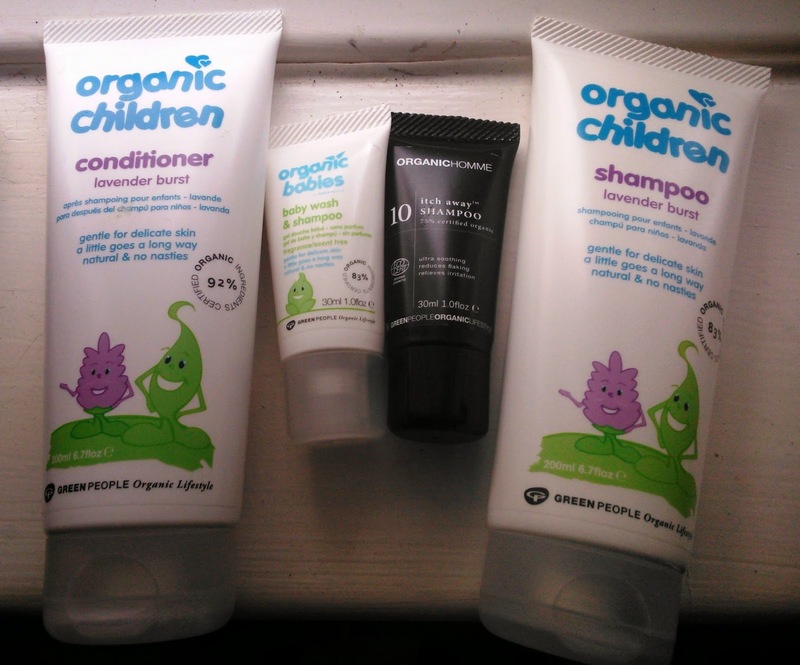 Two huge companies within the baby and child toiletries industry, so I am not a happy bunny! Thankfully Chunk's eczema means he only ever uses eczema creams and oils for bathing, but he still needs shampoo and conditioner. I went into town and looked at a few shops, and every single product I looked at had one of those chemicals in- even the 'organic' and very expensive products tended to have the sodium benzoate in them. I assumed I would easily find a product online, but OH NO. I was looking at companies across the world, and reading articles about child-friendly shampoos, and I trawled through many lists of ingredients on every single product. After two weeks I was losing the will to live, and then thankfully found the company Green People. Their 'Lavender Burst Shampoo and Conditioner' don't contain SLS or Sodium Benzoate, and they are also suitable for children with eczema. HALLELUJAH! I got in touch with the company and they kindly sent me some samples to try on Chunk, as well as some 'Itch Away' shampoo for me to try, as I suffer from a dry scalp. We have been using them for a few weeks now, and they are fab! Chunk has not had any eczema reaction to the products, and they have a sweet, subtle smell. His hair feels clean and soft after use, and I'm itching a lot less! So if you're looking for SLS/SB free hair products, give them a try. They are not as cheap as I'm used to, with their RRP as £8.50 each, but on Amazon they have been half price at times, so I've stocked up! If you know of any other products that don't have these additives in, please comment below so I can make a list on here. Popping across from the ThankfulThursday linky. Thanks for sharing this, it really is soul-destroyingly hard to find natural baby products! I'm a big fan of purepotions.co.uk. They only make a few products but they work incredibly well and don't contain these additives. So what's the issue with that ingredient??? I don't know a lot about that kind of stuff! AND I have a hair product addiction LOL - I am always buying a new shampoo or something. So let me know!